Final Draft. I love it. And I hate it. What do I hate? Well, “hate” is a strong word. I reserve that for folks like the Westboro Baptist Church, Monsanto, and shows like The Bachelor. But what do I strongly dislike about Final Draft? Dislike 2) The interface/user experience. It feels so, well, 1994. The game has changed when it comes to simplicity and elegance. That “1990’s desktop” feeling permeates Final Draft, and its cousin, Movie Magic Screenwriter. To strain a metaphor, it feels like I’m driving a 1994 Ford Taurus in the age of the Smart Car and the Mini-Cooper. Dislike 3) The price. $250 is a big chunk of change for most screenwriters. But I don’t blame Final Draft – they’ve created and marketed a great product that basically came to dominate the screenwriting space. And that wasn’t just through great marketing. There are tons of great things about Final Draft, and most folks wouldn’t dream of trading their Final Draft for another screenwriting app. But remember 1992? That was the year Microsoft released their first Microsoft Office package. It had Word, Excel, Powerpoint, and a precursor to Outlook called Mail. All for the low, low price of $799. Ahem. $799. Yet there’s something to be said about keeping your flagship product at a premium price. If Final Draft were to suddenly cut their price from $250 to $79, granted, a lot of old school screenwriters and industry professionals who use it might – might – take pause, and question whether or not their favorite venerable screenwriting software standard has dropped some of its features. But is Final Draft really worried about that? In my opinion, speaking as a screenwriter and a script reader, Final Draft is missing the big boat right now. And that boat is: everybody’s now a screenwriter. A skiff attached to that boat is the fact that those screenwriters are moving faster and faster away from the “desktop” application, and more towards tablet-based apps and mobile apps. Final Draft appears to have caught wind of this, and has developed their Final Draft Writer app for the iPad. Point is: Final Draft can have its $249 desktop version, and its $49 iPad version, but in my opinion, based on my experience, that price point disparity can cause confusion, among both older screenwriters and younger, more mobile-oriented screenwriters. And confused potential customers tend to abandon their shopping cart. Now, sure, screenwriters who got their start during the heady days of the typewriter, like me and many of my generation, are probably not keen on the idea of writing a screenplay on a tablet, but for thousands of young screenwriters, writing movies on an iPad or an iPhone is not as far a leap. And that’s more and more becoming the reality of screenwriting. Faster. And, if you can even conceive it, as I’ve, admittedly, had some trouble doing: even more portable than a laptop. I’m not going to be the one who rings the death knell on the idea of desktop apps in general, but I will say this: the day of the $249 desktop app will soon be over. I’m no Final Draft company insider, but if I was the CEO, I’d take a long hard look at what sense it makes to have a desktop app priced at $249 which doesn’t seem to be much different from the mobile app priced at $49. Please note: I’m not here to rake Final Draft over the coals. They put out a fine product, but that product is just, well…getting old. Meanwhile, the number of new screenwriters grows every day. How many of them 5 years from now are going to be gravitating towards a $249 price point? How many of them can afford to pay their student loans, let alone finance a copy of Final Draft? But take heart! There are now cheaper and free alternatives that, in my opinion, really give Final Draft a run for its money. Whereas software development used to be the realm of large, well-funded companies and teams made up of dozens, if not hundreds of developers and programmers, now it’s all about the smaller, more agile companies rushing in to fill an ever-increasing demand for lighter, cheaper apps. And a few of those apps have finally gotten my attention. And I’m a desktop guy who, up until recently, would vehemently poo-poo using anything other than Final Draft. Wow! This app is, hands down, the most elegant, easy-to-use, streamlined little firecracker of a screenwriting program I’ve ever used. And I’ve used them all. The interface is sleek, plain, and modern, and fully customizable. For new screenwriters: By tabbing I mean, for example, you type INT. COFFEE SHOP – NIGHT, then hit Tab and it jumps down and awaits your input for the action/description line. All good screenwriting programs do this, of course, but Trelby’s just feels FAST. Faster than any I’ve used. I know… I know. It’s a small thing to complain about. But those tiny bits of “lag” – even if they’re just mere milliseconds between your keystroke and what appears on the screen – they really add up. Especially over the course of a 90-page screenplay, consisting of 6 months of work, and 20-30 drafts. Trelby’s lag is virtually non-existent, even when I loaded in a test script. Oh, and by the way, Trebly inputs Final Draft files, and saves Final Draft files, so if you’re thinking of making the switch, you can do so in a very friendly, non-destructive way. The only major drawback to Trelby that I could find was that it doesn’t have the ability to lock and color-code revision pages. If your production is going to PINK, there’s nothing I could find in the software or on the website that enables you to do it with as much ease as you would in Final Draft or Screenwriter. But for me, the lightweight feel of Trelby, and its ability to export to Final Draft, are the things that are gonna compel me to give Trelby a shot on my next screenplay. For me, the lag is unbearable on other software packages, so this is a real lifesaver. For others, they may not care or even notice the lag, so Trelby would be less appealing, especially without the easy color-revision pages feature. The good news is, Trelby is open source and seems to be adding features all the time. 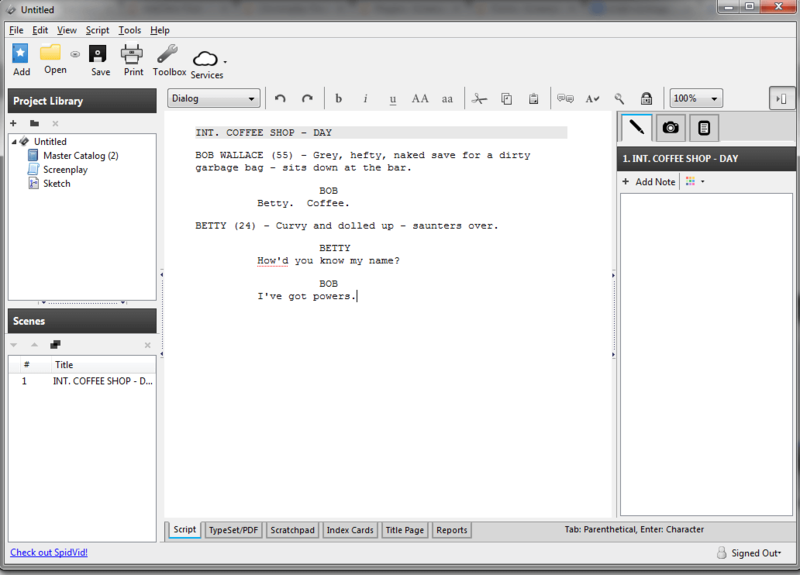 Celtx has been around for a while, and they’ve won over a lot of screenwriters with their feature-packed free screenwriting software, and their cloud-based paid version. Both feature all the goodness you’d expect from a world-class screenwriting program, but the paid version offers a few more wells and bhistles. The most prominent of those features being clip art you’d use for scene blocking/storyboarding, etc. The suite is responsive enough, but the major drawback for me is the sheer amount of clunk and window space it takes up. It seems everything you do opens up another window, and it fills up your screen pretty fast. Not to mention the amount of tabs, buttons, and menus can really be daunting for the uninitiated. The suite itself is powerful and quickly becoming its own standard. But the design and usability? It definitely feels like sitting down in front of an Avid video editing program for the first time. And I’m not sure that’s a good thing for all screenwriters. FadeIn Pro’s features list is overwhelmingly plump. And its design and usability puts it ahead of Final Draft in many ways. FadeIn is impressive. It’s a great screenwriting program, and packs a wallop of elegance and usability, as well as all the features you’d expect from a screenwriting package. Scene navigator, easy tabbing, lots of import/export options (to/from Final Draft and many others), and even page-color/revisions. For $79, it may be worth it to just jump right in. I advise not trying the demo, as it’ll only drive you away. The underlying program is solid and I’m sure it won’t disappoint. The bottom line: Final Draft is still the big gorilla. People still see it as the industry standard. But with more and more modern, elegant, streamlined, super-responsive, and future-proof desktop and mobile screenwriting apps hitting the market, and especially with their increasing compatibility with Final Draft files, you owe it to yourself as a smart screenwriter to take a second look. Final Draft will probably always be there in case you’re not happy. Read their response to my blog post here. But with so many new awesome screenwriting program choices, how can anyone not be happy? Trelby is an “elegant, easy-to-use, streamlined little firecracker of a screenwriting program…”. As you have noticed, you can’t lock the script, and the developeres have stated thet it NEVER will get this feature. Their argument is that the software design will make it virually impossible to implement, and that you, if your script is accepted and goes into production, can afford to buy Final Draft. Yeah, I did notice that, and mentioned it in my article as a drawback. But one of the key differences between Trelby and Final Draft is that Trelby’s source code is freely available to developers to make their own versions or add their own features based on the Trelby code, so I wouldn’t rule out future features or versions. Not to mention, the program has a great import/export to/from Final Draft if needed. I really enjoyed reading your post and found the recommendation very usefull. Not unlike you, after some 25 years in IT, I switched to screenwriting and then producing feature films. When I started, some 15 years ago, I tried out Final Draft and found it cumbersome, so I made my own version based on Word styles and macros, which I used happily ever after, imposing it successfully on practically all the screenwriters I work with, who were happy to find something very much FD but without the constraints. And of course, free. When I switched to Open Office some 5 years ago, I adapted my styles, and now I’m really free (although I must admit I’ve lost some minor features, mainly because I wasn’t patient enough to trial and error my way through undocumented OO stuff). Only recently have I stumbled upon a particularly tough cookie screenwriter who won’t hear about anything but FD. So your recommendation for alternatives was a blessing. It’s not that I can’t spare $249, I simply find it high robbery to ask so much for so little. A trivial style sheet, which takes a couple of hours to taylor to your needs, will supply over 90% of your needs as an experienced screenwriter. So FD or eqiuvalent should not cost more than ten bucks or so. ANyway, this is just to thank you, when I read your post from 4 years ago, I felt like meeting a soul body. Hey Elle – thanks for your comments! Glad we could help! Why is the FadeIn demo annoying? I downloaded it but I have not had a chance to play with it much. Mostly because of the popups asking you to buy/register. But I can imagine the program without those popups, of course. It’s just hard to really get into it when they keep slapping across my screen. I am a novelist adapting my own work to a screenplay using Trelby. Now, trelby does not allow copy and paste between itself and the system clipboard. The Trelby manual does however mention that this is possible but fails to list the command that can achieve this. Any idea how this can be done? I thank you in advance. Hey Rajat – That seems a bit strange. I just reinstalled my Windows, but I’ll get Trelby back in there and see if I can mess around with it. This is my main complaint with Trelby. I’ve been using it for a few months now, and this bit makes copying old scenes into new drafts a real hassle. You can copy blocks of text to the system clipboard, but they come back unformatted, or formatted poorly, which means you’re going to spend time formatting everything just to copy between drafts in the same program. Major drawback, but for someone who can’t afford Final Draft, just something we have to deal with for now. Otherwise, this is a great program. Have you tried saving the script with a different name for your second draft? For instance if you first draft is “MyMovie,” your 2nd draft can be “MyMovie2,” then make edits on that? Or would that work the way you write? Nice article Brian. Any word on when v9 of FD will be out? Hey Matt – thanks. I’m not sure, but as part of the beta, I can’t say much about it. Sorry, mate! Can you at least tell us if it has support for retina Macs? Current version looks so fuzzy it’s borderline unusable. Hey Mark – Glad to help! That’s a good hobby to have. My biggest beef with Celtx is that their stageplay formatting is incorrect. FadeIn looks pretty solid in that area. Final Draft has discounts for current students, teachers, military, government, non-profit organizations, senior citizens over 50, film/television industry professionals and we also have competitive upgrades if you own another product. You can actually get the price down to $129.99 with proof of purchase of another screenplay product. They didn’t mention that the playwriting templates for CeltX are nonstandard. They don’t even remotely come close to the standards expected by Samuel French or the Dramatist Guild. This might sound weird, but I’ve heard a few rumors from fellow screenwriters that Celtx steals your script ideas through their “cloud” service. Any truth to this? I have to admit, I did think it was a bit weird it asked me to connect to the internet upon installation. I severely doubt CeltX is in the business of stealing movie ideas. Hahaha, Cliff. They connect to the internet so you can connect your software to your online account, and can save your projects to your online folder too. It’s not stealing your ideas, you don’t need to worry. For me the HUGE drawback of Celtx was how different something could look on the screen as compared to when you printed it out. I’m surprised that didn’t even make it’s way into this article, as it was the one thing that truly drove me to Final Draft. What I see on the program prints out-and I love that. Though I definitely agree that often times the Celtx screen to page placement issues do become annoying, I would only point out two things. Celtx is primarily for storyboarding. Or at least, that is the main function it performs well..
And the second being that, ultimately it IS a GREAT option if you’re broke or a writer/storyboard guy with have the patience to learn ways around the placement issues, when printing. Its also a good alternative program, simply because if you have a non funded writing staff all using Celtx, there are no real issues. Beyond that, every writer should learn to storyboard their ideas. And for those worried about having their ideas stolen. You have a far greater chance of that happening in an unrepresented studio meeting where they “pass” on your project, then it happening via Celtx. You dont have to connect with Celtx, if you chose not to do so. We will not be ready for your service for several months but happy to discover your service. Nice article! I’m wondering what your thoughts are on ScriptBuddy.com. It seems like there are a lot of features here that would work well for a beginner. I’m currently a TA for an intro to film class and I want something the entire class can collaborate on (similar to Google Docs, but with a screenplay); thus far, I’ve run into road blocks. Hey Ben! I haven’t checked out ScriptBuddy, but I will! As far as class collaboration, try WriterDuet.com I believe you can have multiple writers on that, but it’s a paid service. I’ve been fairly happy with what I’m using. I would really like the option of creating custom reports. One of the bugs that sticks in my head is that changing text colors will strip out any other formatting which has been applied. Also FI will render a printed page that is slightly different than one that has converted to PDF first. Not sure if that’s the software, or something else down the line. I just know that FI printed pages are slightly more left aligned. I’m planning on submitting a script and the company are asking for Final Draft or similar formatting. Will Trelby automatically provide me with this or do I have to set up the format (if at all)? I’m a newbie to scriptwriting as you can probably tell. Thank you. Yep, Trelby, like the rest of the apps mentioned do just that. If the company is asking for not just “Final Draft or similar formatting,” but rather “the script file in Final Draft format,” then Trelby can do that too, as it can export to Final Draft file format. Thank you. I’ll give them a closer look. Cross fingers I can understand how to use one. From my experience, Celtx makes your scripts seem longer than they really are. I was a long time Celtx user who recently switched to Trelby. It’s sad that Celtx doesn’t support downloadable PC version anymore. It only supports online-based system. I had old downloaded file and installed on my PC, and it deleted itself. That’s bad! Maybe someone likes to be offline when they write or maybe they don’t have any internet connection, then what should writers do? whatever. I had final draft 8, a friend actually bought it for me, but I’m no longer in contact with them, thus I’m out of a program… as of right now even at $129.00 and then having to have proof of a previous purchase, is still a bit too much for my parents to pay… as I don’t have a job, if I did I’d buy it in an instant because it was simple to use the first time I started using it and didn’t need a tour of how to use the program… I can’t use any other program and I don’t really want to – I don’t really see how the milliseconds add up, sure mine does lock up a bit, but it doesn’t [as far as the last time I used it on my old drive] crash, the only ‘crashing’ was my system because either the CPU fan was clogged with dust bunnies, or the power supply was buggy, or sticky and filter keys option on XP could have been what caused it… either way I’m out of sticky-keys as well. wish there was a way I could transfer all the program files from one drive to another, or grab the activation code and use that very same code for the one on the new drive… as they have a limit on how many programs can be ran at one time… probably even on a disconnected hard drive… but I hope not or I may very well have to find another program that of which won’t be as wonderful as final draft and I’ll just have to submit my work without all the better words. Trelby is amazingly easy to use. I’m not sure why anyone would choose to spend money on final draft. Thanks for this breakdown. I’m going to try Trelby, and if I end up needing FD, then I’ll just buy it then. I can probably afford it (although I’d prefer not to spend $250 if I don’t need to! ), but the stories of the crashes made me figure I could work with a free program for a while. Highland sounds intriguing, but I only own PCs/Android. Alas! I chuckled at your #2 dislike of the interface. When I first got the trial version of Final Draft and opened it, the interface looked so dated and ugly that I thought I’d downloaded or opened the wrong software. That mid-90s microsoft look really distracts me. Hey Todd! Have no fear. I’ve got the free CeltX desktop Mac version here: https://screenplayreaders.com/celtx/ It’s also still available on a few sites here and there. Hi, I’m new to scriptwriting. I’ve been writing my script in the final draft trial version, this has now ended and I need help! I can’t afford to buy Final Draft so I’m thinking of using Trelby, as recommended. All the features are locked in final draft and I can’t print it out. You mention importing in to Trelby. Does this mean I can import my saved script from the locked up trial version of Final Draft? Any help you can give would be brilliant as I’m at a loss as to how to progress with my script. Hi Julie – Trelby imports Final Draft files. If you’re on a PC and have Trelby, give it a try! I just did it and it works fine. Great little Article. Too bad that there is no Trelby Mac Version yet. But i have hope, some People working on it. It is one of the best Focuswriter under the Screenwriting Programs for me. Its not necessary. celtx will work on Mint and other Distribution – except on newest Linux Systems it will crash and nobody knows, why. Sometimes then it works fine, if you start it with sudo (gksudo on Gnome, ksudo on KDE) – but its not an all-time option. Atom (https://atom.io) can work with fountain and Markdown and runs on every System. Scrivener (https://www.literatureandlatte.com) is also an not so much cost Option – it has a Screenplay Mode for writing and handles Final Draft and fountain (Mac Version only of the Moment) too. The Windows Version runs fine under Wine on Linux beside the free, but sometimes buggy Linux Beta Version. And another alternative: DramaQueen (http://dramaqueen.info). They hold a free Version beside paid Plans. There are many other good alternatives out there. And fountain for Smartphone/Tablet Users are one of the best Options (DubScript for Anroid as an Example). 2016-07-25 NICE THREAD I am a novice screen writer and use Scrivener. From memory it was about $50. Very versatile, slightly pedantic, but on a large script the spacing has changed (each line touches the line above it and is a pain to fix manually). There is a memory drop bar for each spacing action you do, (text format bar) but it is still very hard to navigate each time. There must be some global setting but I cant seem to fix. I don’t have time to waste on it, I’m just going to buy something else. Why after download does it say that this product is from an unknown source? Dangerous to put anything from an unknown publisher on the hard drive? What exactly are you downloading? Brian, answer to a question please? I have Movie Magic my friend on the Left Coast has Final Draft. We would like to write a script together. Are the two systems import/export compatible at all? Will she be able to open what I send her and vice versa? It seems the answer is no but I wish to get the final word on this so I am asking you. I have read your blog. You know what you are talking about. ( not a lot of that going around these days on any front) Anticipating a need for an alternative, I am considering trying to marry Trelby with her Final Draft with this particular script as I can not justify investing another $250 in Final Draft. I have always been happy with MMSW…………….Thanks……..John T.
Hey John – You guys can export/import RTFs back and forth between FD and MMSW, but the formatting doesn’t always stay consistent, so if you’re down for keeping an eye on that sort of stuff, everything should work fine between those two apps. If the project is interesting for someone and you decide to try it, I’ll be glad to hear your opinion about it. Maybe you have suggestions for improvement, or just want to express your opinion, then happy to hear you. I am personally on the look for the oldest and most basic software there is. I’ve been using celtx since the beginning (just over two years now) and like it apart from the fact that it is online so I have to be connected to the internet to use it, and I dislike how little space there is to write at the bottom of the page because I like to have the whole page blank and move it so the cursor is always at the top. But I don’t see a reason why I should pay so much money when structuring a script is so easy. One of my teachers actually dislikes any software and makes us use Word because he thinks that the basics of a screenwriter’s ability is to know how to structure a page (again, very easy, seriously, we’re supposed to be intelligent). Also I like to work in a completely isolated environment and you can only get that if you’re not connected to the internet. When there’s nothing to distract you and your whole existence at that moment is focused on writing. So I’m gonna try to find the most basic scriptwriting software and just use that. I am a newbe and am using the tryout version of FD9 but it is buggy as h.ll. Saving goes wrong frequently: it doesn’t save while it says it does (upon later re-opening the changes appear not to have been saved). Or it says that it cannot save because the file already exists and then forces me to save under another file name…? For that reason alone I’m looking for another program. The more after reading about the program crashing. What I like about Celtx is that it organizes the episodes, if one is writing episodes, which I am (two series of short instructional videos in my line of work). I really need that. Does anyone know of another program that does that? Because I find 10 bucks subscription fee every month that Celtx asks too expensive. Celtx is only free for a limited time. Then it shuts you out of your projects unless you give them your credit card info. I may need to pay just to get my stuff back. Hey Allie, I was thinking this too, but this is incorrect; you can still get to your work through the “projects” button without the paywall. I agree it’s very misleading though/pressures you to pay. That deception, and the buggyness of their new web app, is one of the reasons I’m looking to make the jump from CeltX after over 10 years. I’ve been using Trelby for a couple of years. Glad to see it topped your list! I’ve never used anything else, or felt the need to, so I can’t compare it, but can say I find it to be fabulous. If I ever make any money from my writing I’ll be sure to make a decent contribution to the authors…they deserve a reward for such a great effort! I like the fact that I’ve been able to export files to FD, as I have a friend that uses that. And I’ve never had any problems with cut and paste….within the same draft it works fine. From another draft just load them both and away you go! One thing to note is you need to put in the proper margins….top, bottom and right – 1 inch and left 1.5, and then it will match FD page for page. Also make sure you set the paper size for U.S. letter! Thanks a million for suggesting Trelby. It’s indeed a better alternative to FinalDraft. went with fade in, so easy to use. its 79 dollars now, yet still worth every penny, so glad i found this article. I am going to give Trelby a shot but first i want to thank you for this effort. I use Mellel. And I just got an email saying their new version supports us scriptwriters. Has story features that organize plots. I love Mellel. Used it for other writing. Exports to everything. Doesn’t crash. Creates chapters automatically, no widows and orphans. Sounds good but Mac only I believe. Have just returned to screen writing after an annus horribilis ( don’t ask dear boy, the vicissitudes of life ) and reacquainted myself with Trelby. Still seems to me to work best on Windows and I do enjoy its speed and relative stability. Did have a problem a while back remotely co-authoring a script. Partner was using FD8, yours truly on Trelby and he could not see my changes (I could see his). After a month or two of bafflement and being called a lazy bugger resorted to exporting him PDFs and face to face run-throughs on Skype. Great fun. Do dislike FD like you for similar reasons. There seems to be an FD mafia out there and, alas, many aspiring writers convinced that a script can only be any good if it is in FD. FD will NOT write a good script for you. That takes application and talent. However not using FD can give agents and execs just another excuse not to look at your work. What non FD software works most seamlessly with it? Sir Stoke – A terrible workflow, that! (Swapping PDFs and then Skype calling to track the changes). FadeIn Pro is what I use. Imports/exports Final Draft files seamlessly. Lightweight. Continually updated and patched. The only way you can go wrong with it is if you light your computer on fire. I agree Sir, most time wasting and disagreeable but the product of panic and deadlines. One can waste so much time saving time. Thank you for your suggestion of Fadein Pro. I shall certainly put it to the test. Your comment on fire hazards puts me in mind of my younger years working an all nighter with a Moviola and fueled by coffee and cigars. Whole shebang went up including my eyebrows. Nitrate film stock in those days. Bye the bye, hate to be pedantic but one is addressed as Sir Limply, never Sir Stoke – but you were not to know. I bought Final Draft ( disc ) for my old Mac laptop. Now I have a new MacBook and nothing written on Final Draft migrated successfully to it…the new Mac can’t open any of it. Hey Denise – Email me. brian@screenplayreaders.com Let me know what version of Final Draft you wrote ’em in, what version of Final Draft you’re trying to open ’em in, what model MacBook, and what OS X version you’re running (El Capitan? Mavericks? Sierra?). And attach the scripts if you like. I’ll see what I can do. I haven’t been able to figure out why my script in Final Draft is 95 pages but in Trelby is 91 pages. 1 inch top, 1 inch bottom, 12 Ct Courier New. As far as I can tell all the settings are the same. The thing Trelby doesn’t seem to have, that drives me crazy, is it doesn’t page break at the end of a sentence. It cuts in the middle of a sentence. I can’t find a setting for that. I followed the link to ‘action-pro.tv but the description says it is written for older iOS. It doesn’t mention ois10. Have the developers given up on it? I’ll try Trelby or Fade-in. Thanks for the useful info. In Linux with any text editor (I use the Jstar variation of JOE because I like the WordStar keystrokes, but you can use any true text editor) you can type in Fountain syntax and use the offline version of Screenplain to convert to PDF, Final Draft (.fdx) or HTML formats. With pdftotext (a common Linux utility) you can convert your PDF into formatted text. All done in the Terminal without any GUI. (I even use an Alphasmart Neo — dedicated word processor — to write scripts, then send them into Jstar. Fountain syntax is the key, see information at http://www.fountain.io). I was a huge fan of SCRIPTWARE. I became friends with Ben Cahan and he gave me a free copy of Final Draft 8, the promo version at the time. It is the full version, not a trial. I found it to nowhere near as user-friendly as Scriptware. A do have two questions re Trelby, the one it sounds like I’ll switch to. 1. Even after writing 5 screenplays and two novels, I still consider myself computer illiterate. I’ve always had trouble converting things to PDF. Final Draft does make that easy. Does Trelby do the same? 2. Though Final Draft does claim to let one put two different drafts of a screenplay side by side on the same screen, I can’t figure it out at all. The manual didn’t help. Even talking to a live FD person on the phone didn’t help. Does Trebly have and easy way to do this? New to screenplay writing. Any help on how I can get my screenplay into the right hands? Hi Cornelius – The only advice I ever give: Move to LA if you’re not here already. Help people make their films. Make friends. That’s it. Everything else is a roll of the dice. Working here and making friends is a roll of the dice as well, but has a higher chance of succeeding, and at worst is something which pays off either way. Thank you B. O’Malley. I am currently in South Africa, so not so sure that it will be simple, yet something I will definitely consider. Perhaps even a visit might get me in contact with someone. I see this blog began 5 years ago. Would Trelby still be your number one alternative to Final Draft? I have FD in a older damaged computer and assume without the old receipt for FD or a customer number (which I lost over time) it would be impossible to just transfer it somehow to the new laptop? You wrote that Trelby can export into a FD readable version if required by a producer or script consultant or reader. Is that export an easy process? And, can I import the scripts I have in FD into Trelby so I can continue to work on them? FadeIn or Script Studio currently. Not sure re: your last question though.